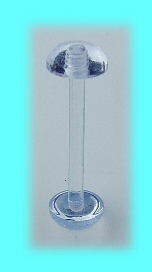 Clear Acrylic Tongue retainers, these are nearly invisible when worn, and are 14mm in length. Extremely popular to hide your tongue piercings, nearly invisible clear acrylic tongue retainers, standard 1.6mm thickness, 14mm bar length. Clear see through tongue retainers with see through flat domes to hide your tongue piercings. These are extremely popular and very good at making your tongue piercing almost invisible. There are more tongue and body jewellery retainers on the retainers page. The best eCommerce software by ShopFactory powers P8683. All-in one eCommerce and shopping cart software.